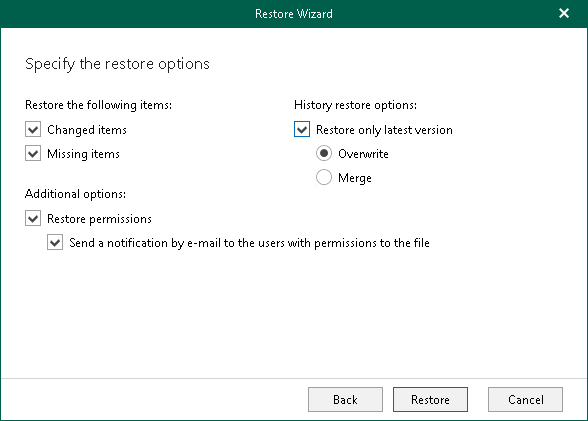 At this step of the wizard, specify restore options and click Restore. Changed items. Allows you to recover data that has been modified in your production environment. Missed items. Allows you to recover missed items. If the library (or list) does not exist on target, it will be created inheriting permissions from the parent object. If the library (or list) already exists on target, permissions will be preserved. Overwrite. To overwrite data in the production environment by recovering only the latest version of the document from the backup. Merge. To merge an existing version of the document with that of a backup version. If not selected, all the versions in the production environment will be replaced with the corresponding data from the backup file. The Send a notification by e-mail to the users with permission to the file checkbox is only available when restoring data from backups created by Veeam Backup for Microsoft Office 365 for Microsoft Online organizations.